Salt and Pepper Shrimp is a favourite dish found at many western Chinese restaurants. It’s a quick and delicious, and perfect appetizer or snack to eat with Sriracha Mayo. Sometimes I dip it into Sweet Mango Chilli Sauce or Sweet Chili Sauce. My brother asked me for this recipe, as he recently ordered it in a restaurant and loved it. My local fish ‘n chip shop makes a delicious Salt and Pepper Squid, which is what I based my recipe on. My Salt and Pepper Shrimp No Shell Recipe uses potato flour or potato starch, which is gluten free. You could use corn starch, but I always use potato flour over corn starch. I find that it makes my gravies less lumpy as it thickens at a lower temperature compared to flour or corn starch. I always have it on hand. I don’t suggest using flour, a corn/potato starch always gives a crunchier texture. This is a Salt and Pepper Shrimp cooked without the shell. It’s the easiest way to eat shrimp, a lot of shrimp quickly. There are many Asian prawn recipes out there that look beautiful on the plate, but they use unpeeled prawns (with shells), making it hard and messy to eat. Kitchens like making shrimp with the shell on because it’s easier for them. Food leaves the kitchen faster, but it leaves you with the mess of peeling the shrimp! Make sure you buy raw, peeled and deveined shrimp, or green prawns in Australia. Don’t use already cooked shrimp, which looks pink and already boiled, which will taste awful. Raw shrimp sometimes costs a bit more, but it’s worth it for the difference in taste! 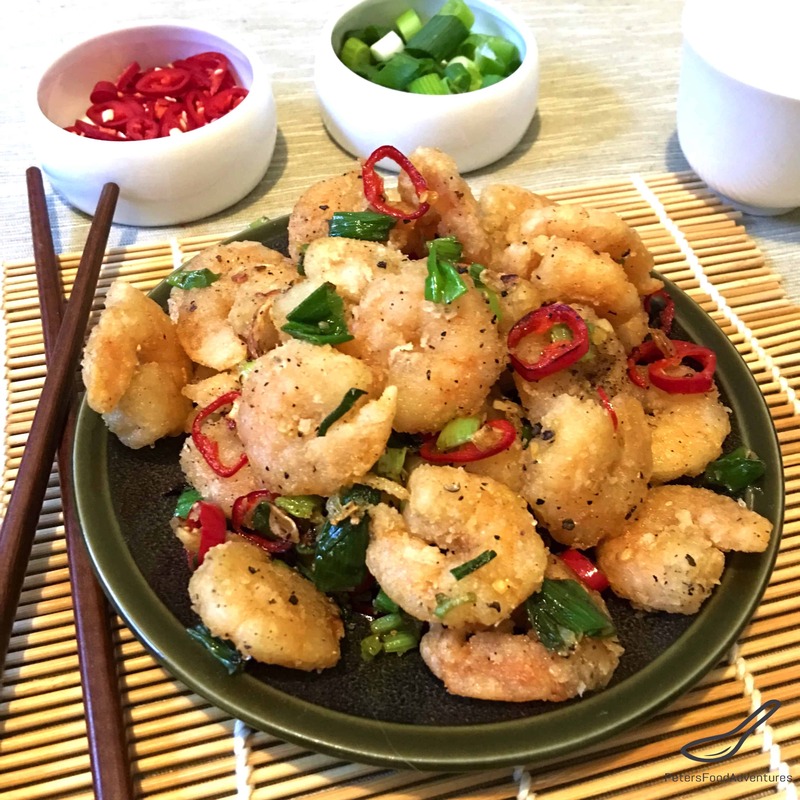 Salt and Pepper Shrimp No Shell Recipe, reminds me of a version of Asian Popcorn Shrimp, but much tastier. Some people say Red Lobster invented Popcorn Shrimp in the 1970’s. It’s popularity spread around the world. Popcorn Shrimp is usually deep fried in oil. My Salt and Pepper Shrimp recipe is fried in oil, but in a hot wok. The oil is fresher because it’s not reused as in a deep fryer. Together with the green onions and chopped chili peppers, I love eating this meal. It’s supposed to be an appetizer, but I sometimes eat it for dinner. Once you start, you won’t be able to stop (or share). Bon Appetit! Приятного аппетита! 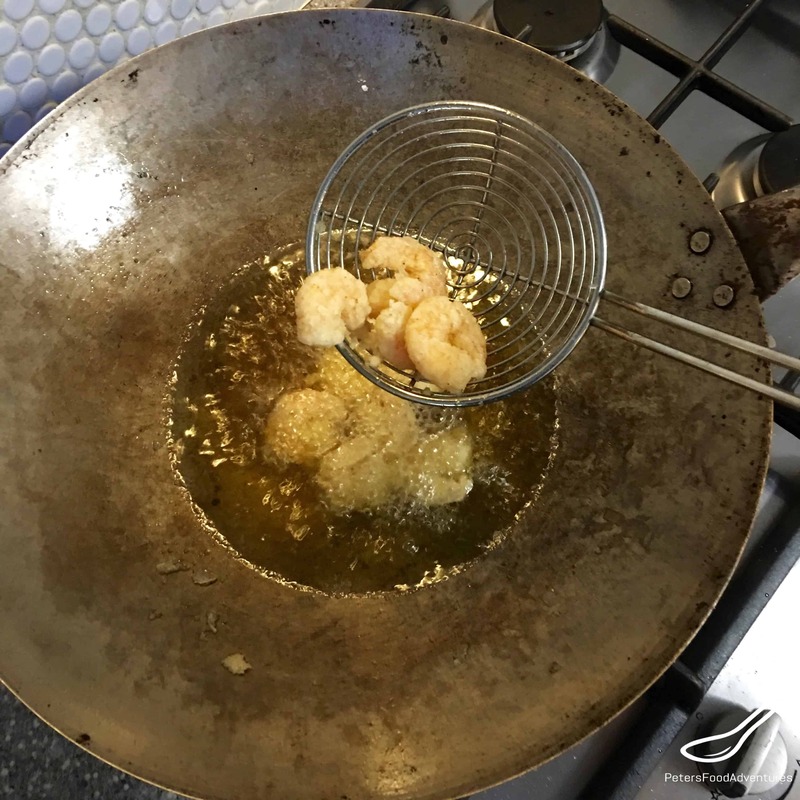 Heat oil in a wok or a deep fryer on high heat. Mix together potato flour, white and black pepper and salt in a plate or small bowl. 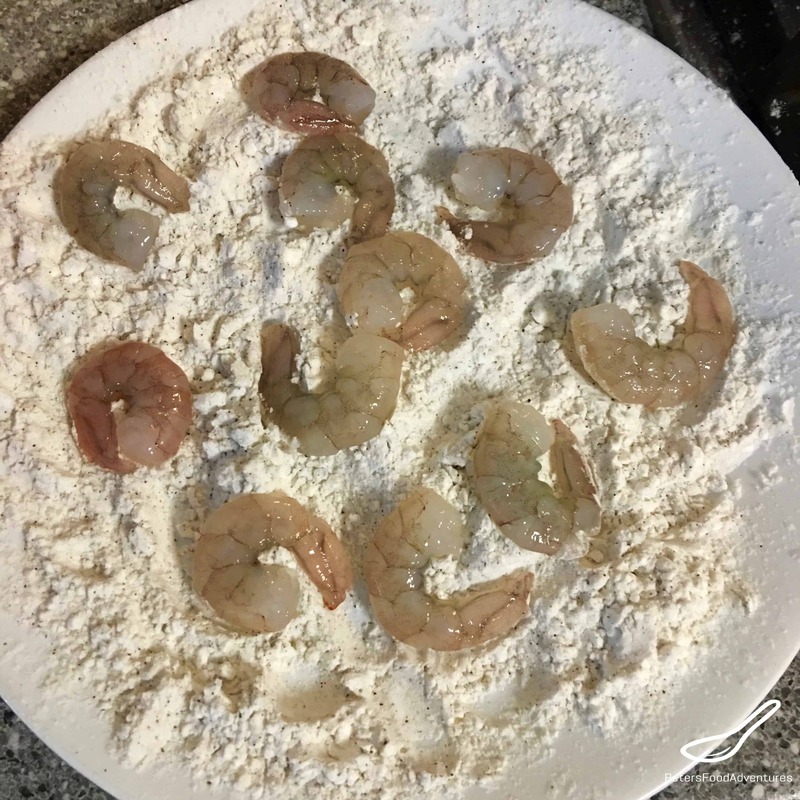 Lightly toss 10 shrimp at a time in the potato flour mixture, shaking off any excess. Cook the shrimp carefully in the hot oil, until it's pink in colour (about 3-5 minutes). Remove and allow to drain on paper towel on a plate. Repeat until all shrimp is fried. *Optional - keep the shrimp on a baking tray in the oven to keep warm in between cooking batches. 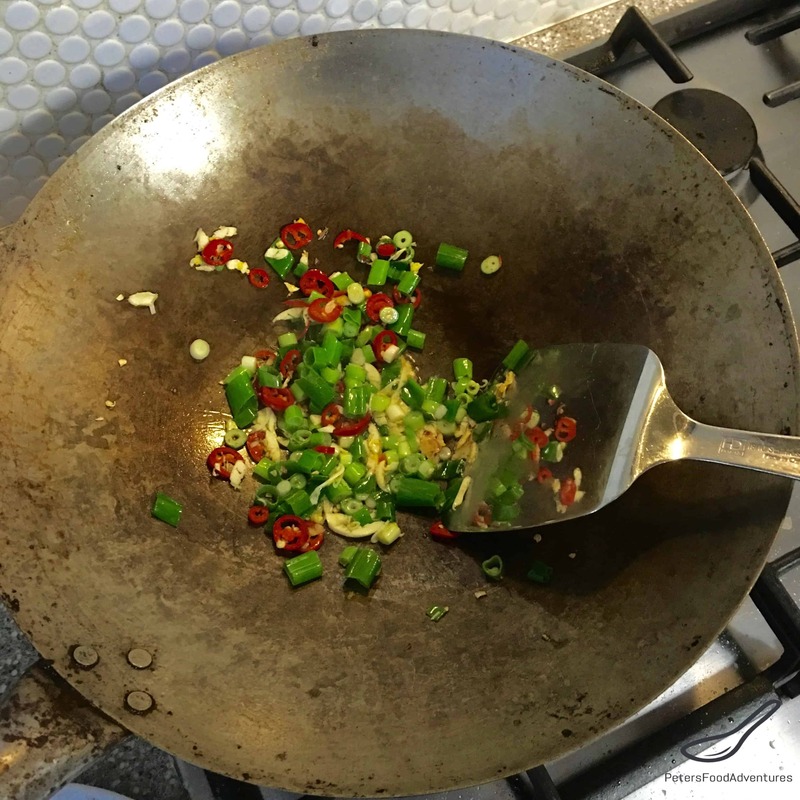 Put about 1-2 tablespoons oil in a wok over medium high heat. Flash fry green onion, red chilli peppers, and garlic cloves for no more than 2 minutes. Add the shrimp into the onion mixture and mix together. Season with salt and pepper to taste. Very appetizing! With this dish, I could eat many bowls of rice!! Haha! Yes, it’s very delicious! Thanks Lynne! I stuff myself silly when we eat this! ???? Potato flour works much better than regular flour! Really good, wife devoured it and left me nothing! This WAS really good Peter. I just made it and absolutely loved the amazing texture and light crunch on the shrimp. I didn’t have potatoe flour and used cornstarch as a substitute. Absolutely delicious over rice with your sweet mango chilli sauce. Perfectly fine to eat shells, also. They get crispy and crunchy and helps the texture. If u boil shrimp with the shell, not so good. The frying changes the molecular compisition as opposed to boiling… Hope this helps!!! Great info! But I still think I prefer the pure shrimp without shells. Maybe one day I will try it tho! ??? ?